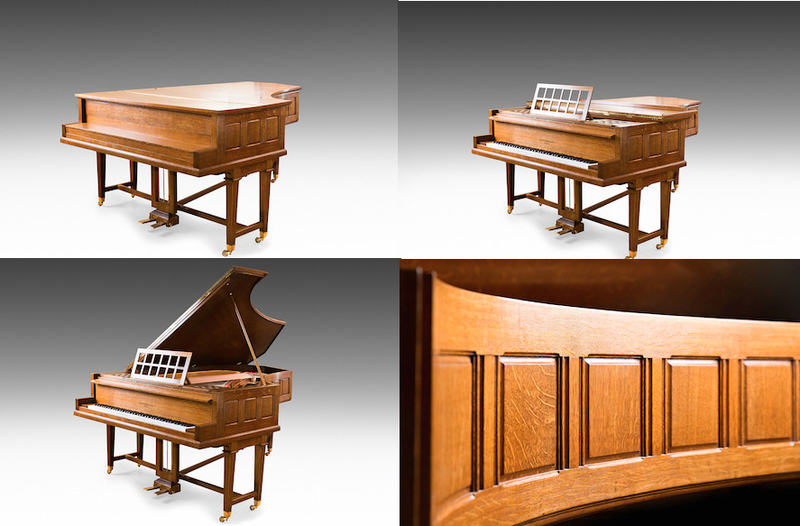 This grand piano, made by John Broadwood & Sons London, is from the Arts and Craft period and veneered in quarter sawn Oak. The finish was French Polished by me and is left open grained, then dulled down & waxed. It is known that Lutyens collaborated with the piano maker John Broadwood & Sons on several instruments, some of which were on display at the Paris Exposition of 1910. One of his pianos is owned - though not displayed - by London's Victoria & Albert Museum and at least another two change hands in the last five or six years. The piano illustrated here is probably one of the prettiest. The oak is a beautiful honey colour, the curve of the right flank is very effective with lovely paneling and the legs, so simple, rather like extended versions of the legs to the Napoleon chair. As well as clearly being of Lutyens's hand, this piano comes with an impeccable provenance. It is featured in the Broadwood archive and a letter exists showing that it was sold to a Mr Benson (of the banking family that was one half of Kleinwort Benson). Robert Benson rented a house called Buckhurst Park in Sussex on a 21 year lease from 1899 with the stipulation that he was free to make alterations. Lutyens was appointed to make the alterations which included a music room. Apparently Lutyens and Benson were also members of the same London club! There would appear to be no reasonable doubt that the piano was built especially for the aforementioned music room, having been designed by Lutyens. The piano has recently been most beautifully restored both inside and out.